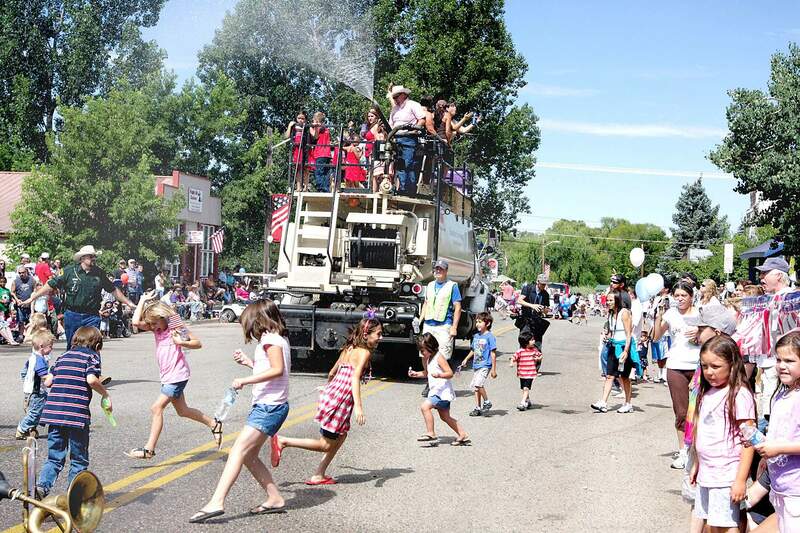 Children play in the water pumped out by the Wells Liquor and Cross Fire Seeding float during the Bayfield 4th of July Parade in 2014. Fourth of July is on Wednesday and Independence Day events are scheduled for Southwest Colorado, with festivities and fun in Durango, Silverton, Bayfield, Mancos and Cortez. DurangoFourth of July River Parade all day at Mild to Wild Rafting, 50 Animas View Drive, www.mild2wildrafting.com.Rotary Club of Durango events, including an All-American Gourmet Breakfast at 7:30 a.m.; Freedom 5K run at 9 a.m.,; live readings of “American Voices: What it Means to be an American” at 9:15 a.m.; and gourmet barbecue picnic at 11 a.m. in Rotary Park, 1565 East Second Ave.Patriotic Pedalers 60- and 40-mile bike rides led by professional cyclist Todd Wells at 8:30 a.m. at Park Elementary School, 510 East Sixth Ave.Independence Day celebration with food and drink specials starting at 11 a.m. at the Cavern Bar and Grill, 640 Main Ave.Fourth of July celebration by Building Homes for Heroes and the city of Durango at noon in Buckley Park, 1250 Main Ave.Stars and Stripes Parade by the city of Durango at 5 p.m. on Main Avenue from College Drive to 13th Street.Independence Day Dance by KSUT Public Radio and the city of Durango at 6 p.m. at Durango Transit Center, 250 W. Eighth St.Live music will be provided by Southwest Civic Winds at 10:15 am. in Rotary Park, 1565 East Second Ave.; The Cannondolls at noon and The Pete Giuliani Band at 2:30 p.m. in Buckley Park, 1250 Main Ave.; Six Dollar String Band at 2:30 p.m. at 11th Street Station, 1101 Main Ave.; The High Rollers at 6 p.m. at Durango Transit Center, 250 W. Eighth St.; and Void Where Prohibited at 6 p.m. at the Balcony Bar and Grill, 600 Main Ave.Note: The fireworks display is canceled in Durango because of weather trends and fire danger. For more information, visit https://bit.ly/2KukkWl. Silverton2K, 5K and 10K Blue Ribbon Fun Run at 8 a.m. in Memorial Park, 1600 Greene St.Fourth of July Parade and Water Fight at 10:30 a.m. near the intersection of Green and Blair streets.Fourth of July Carnival and Silverton Brass Band Concert at noon in Memorial Park, 1600 Greene St.Ducky Derby launch at 2 p.m. on Cement Creek at Memorial Park, 1600 Green St.Green Street Fourth of July Block Party at 6 p.m. at the intersection of 12th and Green streets.Note: The fireworks display is canceled in Silverton because of weather trends and fire danger. No vehicles or camping are allowed on Shrine Hill.For more information, visit www.silverton4thofjuly.org. BayfieldBayfield Lions Club pancake breakfast at 7 a.m. at Lions Hall, 451 Church St.Pie and Craft Sale at 8 a.m. at Calvary Presbyterian Church, 89 E. Mill St.Fourth of July Parade at 10 a.m. on Mill Street.Fourth of July festivities, including a Pine River Rotary Club beer tent, live music by Tomyris at 11 a.m. and a corn hold tournament at 1 p.m. in Joe Stephenson Park, 134 W. Mill St.Serranos annual horseshoe tournament at noon in Eagle Park, 1189 Bayfield Parkway.Note: Parking and a shuttle are available at Bayfield Church of Christ and the Church of Jesus Christ of Latter-day Saints on Bayfield Parkway. Handicap parking is available at Bayfield Town Hall.For more information, visit https://bit.ly/2lHowr1. MancosFourth of July barbecue at 5 p.m. at the Bauer House, 100 Bauer Ave.Live music by Lawn Chair Kings at 6 p.m. at Mancos Brewing Co., 484 E. Frontage Road.For more information, visit www.mancoscolorado.com. CortezCortez Burst Triathlon at 6 a.m. at the Cortez Outdoor Swimming Pool, 803 East Montezuma Ave.Fourth of July fireworks display at 9 p.m. at Parque de Vida, 400 N. Mildred Road.For more information, visit www.cityofcortez.com.